As part of a shared commitment to individuals living with autism, The Dan Marino Foundation and Badia Spices, one of today’s leading family-owned Hispanic food companies have partnered for the sixth consecutive year to “Go the Extra Yard for Those with Autism.” Now through December 31, 2018, when customers purchase a bottle of Badia (1 LT) Extra Virgin Olive Oil anywhere in the world where Badia Spices are sold, Badia will donate 5% of the proceeds from the sales to The Dan Marino Foundation. Badia Spices community support is coordinated through the Badia Family, who personally oversee the company's myriad of philanthropic efforts. Although Badia Spices contributions are all embracing, the company has a primary focus on organizations that are based in South Florida, where the Badia Spices is headquartered. Badia Spices follows the example set forth by their President, Joseph “Pepe” Badia and continued by the Badia Family’s endeavor to enhance and strengthen the communities where our families live, work and play. They believe that as a member of the community, one must make an impact through charitable and community investment. For close to ten years, Badia Spices has supported The Dan Marino Foundation as part of the company’s global philanthropic effort to raise autism awareness, and support the post-secondary opportunities being offered by the Foundation’s Marino Campuses in Miami-Dade and Broward County. Over the course of 10 months, the students – who come to Marino Campus from diverse backgrounds, needs, and experiences – work hard to earn their nationally recognized industry certifications in Hospitality and Technology to ultimately attain gainful employment. With the help of its consumers, Badia Spices has raised over $500,000 for The Dan Marino Foundation through the “Go the Extra Yard for Those with Autism” campaign. 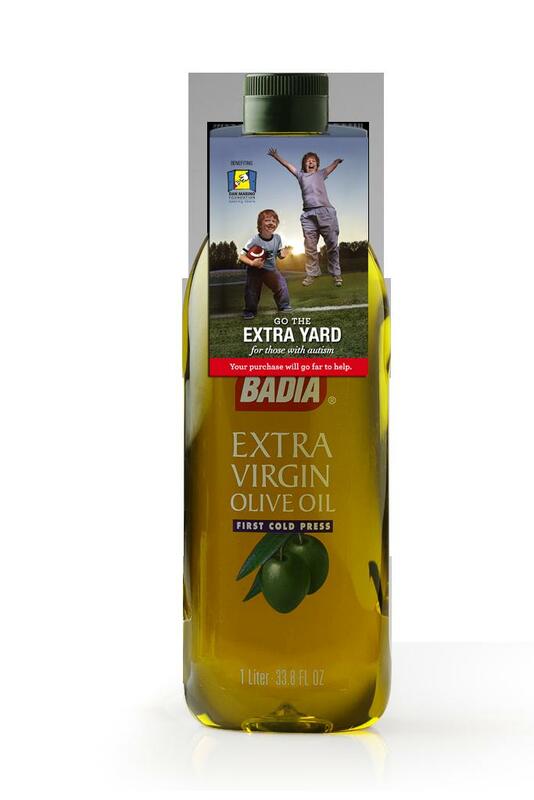 Badia recently added organic Extra Virgin Olive Oil to their product line-up, this product has a rich nutty flavor with delicate notes of fruitiness. Their Olive Oil is made from a combination of the first cold press from Manzanilla, Arbequina, Lechin, and Picual olives. Aside from all the attributed health benefits of olive oil, it is bottled with the promise of full aroma, freshness, and rich flavor. On a daily basis, Badia prepares packages and ships more than 400 different products to more than 84 countries worldwide, which includes the entire United States. For over 26 years, The Dan Marino Foundation (DMF), a results-driven nonprofit organization has been dedicated to “empowering individuals with autism and other developmental disabilities.” Initiatives include postsecondary programs in Fort Lauderdale at Marino Campus Broward, Marino Campus Miami-Dade located at Florida International University, the Nicklaus Children's Hospital Dan Marino Outpatient Center, the Marino Autism Research Institute, ViTA-DMF, Marino Adapted Aquatics, and Summer STEPS Employment Programs. The Foundation’s 2017 Annual Report can be download by clicking here. “Pepe Badia and his family have played an important role in The Dan Marino Foundation’s efforts to insure opportunities for all to achieve. The Badia Spices Olive Oil Campaign brings worldwide focus, promoting acceptance and greater awareness to the value of individuals with autism. My wife Claire and I are honored to call the Badia family our friends, and appreciate The Dan Foundation being chosen once again as the beneficiary of the Badia Spices Olive Oil Campaign,” said, Dan Marino, Chairman of The Dan Marino Foundation. ABOUT BADIA SPICES: Established in 1967 by Jose Badia, Badia Spices, Incorporated is one of today’s leading family-owned Hispanic food companies. Badia manufactures, packages, and distributes spices, seasoning blends, marinades, sauces, teas, health items and other products to more than 70 countries around the world. Badia Spices is proud to offer organic and gluten free products, the company's facility is registered with the Safe Quality Foods (SQF), an audit recognized around the world as being one of the most rigorous and credible food safety management systems in the marketplace today. Across the board, whether consumers purchase products through retail outlets, food distributors or the foodservice industry, Badia is committed to offering the highest quality, at the best price. For more information, go to badiaspices.com.